Origin and Habitat: Southeastern Brazil (Bahia, Minas Gerais, Espirito Santo, Rio de Janeiro, Sao Paulo, and Parana) and also reported as wild or naturalized elswhere. It has a wide range and, although it is not abundant, it is frequently encountered. Altitude: Between 0 and 1850 meters over sea level. Habitat: It is a rain-forest species that grows on trees as an epiphyte (or occasionally on rocks as a lithophytic). In other words, these are cacti that grow in trees! They grow their roots into the bark of their host tree. Their only access to moisture and nutrients is from rain and droppings that fall from above. They also always grow under a canopy of trees and are never exposed to the full sun of the desert. Hariota salicornioides var. bambusoides (F.A.C.Weber) K.Schum. Hariota salicornioides f. gracilior (Salm-Dyck ex C.F.Först.) A.Cast. 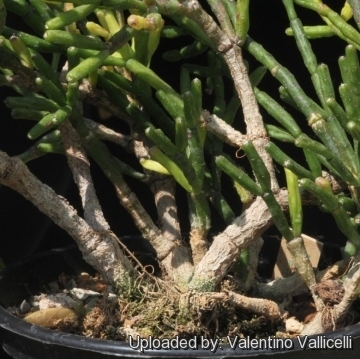 Rhipsalis salicornioides var. gracilior Salm-Dyck ex C.F.Först. Hariota salicornioides var. gracilis (F.A.C.Weber) K.Schum. Hatiora salicornioides var. gracilis (F.A.C.Weber) Backeb. Hatiora salicornioides var. stricta (F.A.C.Weber) Backeb. Hariota salicornioides f. strictior (C.F.Först.) A.Cast. 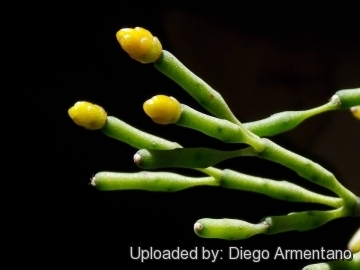 Rhipsalis salicornioides var. strictior C.F.Först. Hariota salicornioides var. villigera (K.Schum.) Backeb. 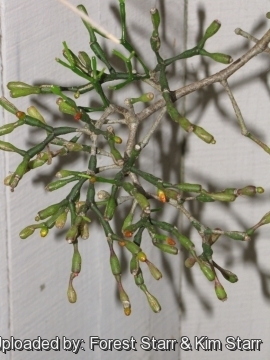 Hariota salicornioides f. villigera (K.Schum.) A.Cast. 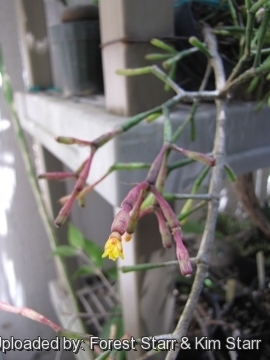 Hatiora salicornioides var. villigera (K.Schum.) Backeb. 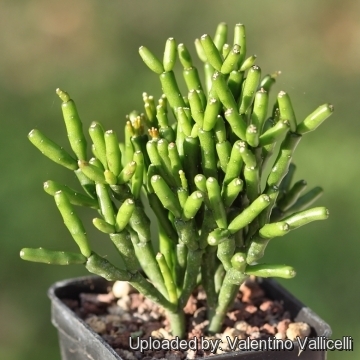 Rhipsalis salicornioides var. villigera (K.Schum.) Loefgr. 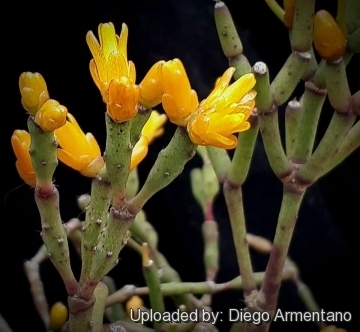 Description: Hatiora salicornioides is a slender, erect, arching or somewhat pendent, bushy, cactus with unique jointed stems and many small yellow-orange flowers. It can be either epiphytic or terrestrial, but is commonly grown as a foliage plant. It has the common name of 'Drunkard's Dream' from the resemblance of the stem sections to bottles of beer. The plant is made of many-branched stems and reaches 30-60(-100) cm in height and spread. It is said that it deserves first place among the Cacti of easy culture. Stems: Joined, becoming woody, very copiously branched. Branchlets (stem-segments) of strictly determinate growth, tiny, pale green to deep green, leaf-less and spineless (1,5-)2-3(-5) cm long, 3-4 mm in diameter, narrow, club-shaped, with a distinct basal neck and expanded tips, looking like an inverted bottle, arising in whorls of two to six from tops of older ones and growing upright for some time before sprawling under their own weight. Areole: Joints have a large woolly composite areole with short bristles at tips of branches from which the flowers and succeeding cladodes arise, the minuscle white spots visible on these stems are, technically, typical cactus areoles minus the spines. Spines: Usually absent, but rarely produced, sometimes towards the base of relatively old stems or, in atavistic fashion, on isolated stem segments. Flowers: Always terminal at tips of younger stem segments, small, bell-shaped orange yellow or light salmon, 1-2 cm long and in diameter. Blooming season: Late winter to early spring. Fruits: White, translucent, top shaped berries. 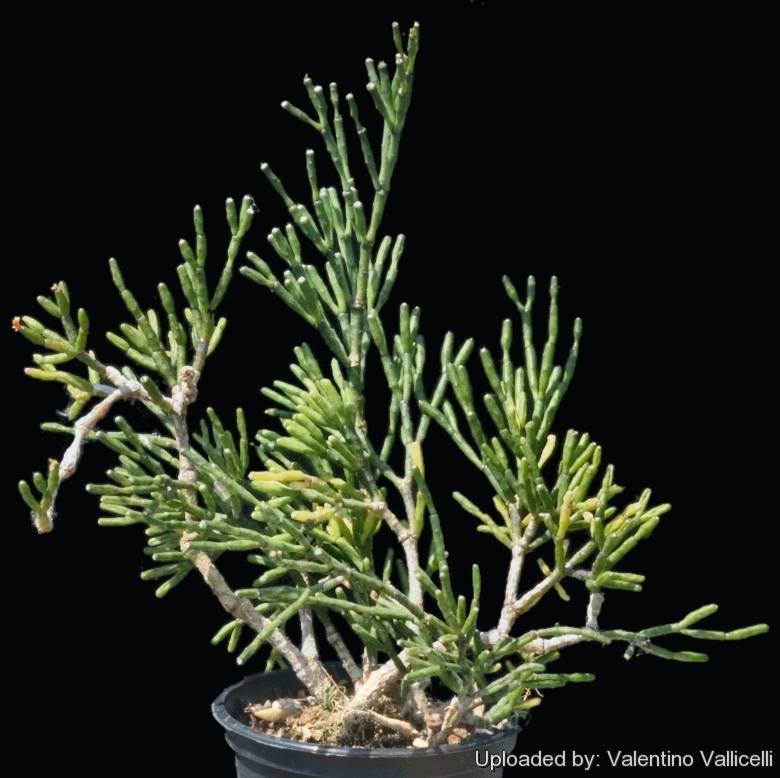 Remarks: Hatiora salicornioides is extremely variable and probably deserves subdivision into infraspecific taxa. Chromosome number: Hatiora salicornioides is a diploid species with a chromosome number of 2n = 2x = 22 . 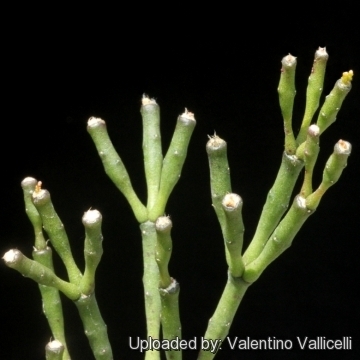 Notes: The specific epithet, "salicornioides" is a reference to the genus Salicornia (Chenopodiaceae) which also has well-marked segmentation of stems. Hatiora differs from Rhipsalis in the stem-segments having very unequal distal and proximal ends and flowers in a pseudoterminal position, rather than lateral. 9) Taylor, N.P. & Zappi, D. 2013. Hatiora salicornioides. In: IUCN 2013. "IUCN Red List of Threatened Species." Version 2013.1. <www.iucnredlist.org>. Downloaded on 02 November 2013. 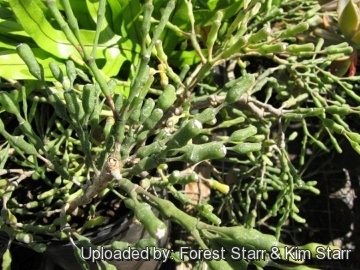 10) Forest & Kim Starr Hatiora salicornioides (drunkard's dream, spice cactus). Plants of Hawaii. <http://www.starrenvironmental.com>. Downloaded on 22 August 2014. And do best in soils containing sphagnum. This type of soil would normally be used for orchids, bromeliads or other epiphytic plants. They require ample summer water and partial shade, but allow soil to dry slightly between waterings; During the flowering cycle keep them moist (but not soggy). After the blossoms have fallen off you should back off on the water for a couple of months. If they need repotting, this is the time to do it. They drop their buds easily if they are moved. Once flower buds have formed, DO NOT MOVE the plant, as slight changes in environment may cause the buds to drop. These forest cacti tend to be long lived.